On Sale Now! Save 4% on the Supco SM1027N Replacement Refrigerator Evaporator Fan Motor Replaces 4681JB1027N, 1579962, 4681JK1004A, 3523326 by Supco at akankshacoolingpoint.com. MPN: SM1027N. Hurry! Limited time offer. Offer valid only while supplies last. Refrigerator Evaporator Fan Motor Replacement PartThis fan motor is a direct replacement for LG 4681JB1027N. This high quality part, Model No. This fan motor is a direct replacement for LG 4681JB1027N. This high quality part, Model No. SM1027N, is designed to meet or exceed OEM specifications. Founded in 1945 in the Bronx, NY by two naval engineers, Sealed Unit Parts Co.,Inc (SUPCO) originated as a service company for refrigeration systems. We bring continued product line expansion through in-house development, master distributor relationships, and acquisition. This strengthens our position as a leader in the HVAC, Refrigeration and Appliance industries. EVAPORATOR FAN REPLACEMENT - This Supco evaporator fan motor is a direct replacement for LG 4681JB1027N. HIGHEST QUALITY PARTS - The SM1027N meets or exceeds OEM specifications. Made in the same factory line as the OEM parts. 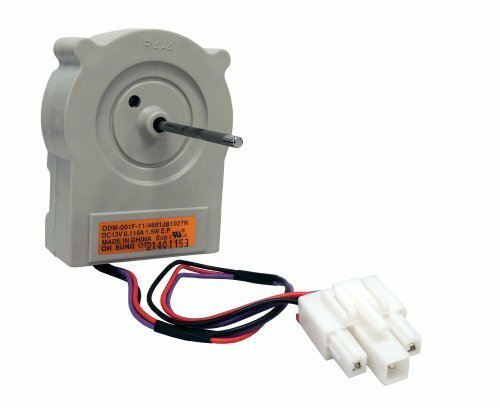 REPLACES VARIOUS MODELS - This evaporator fan motor replaces many other LG models such as: AP4841475, 1579962, 4681JK1004A, AH3523326, EA3523326 and PS3523326.